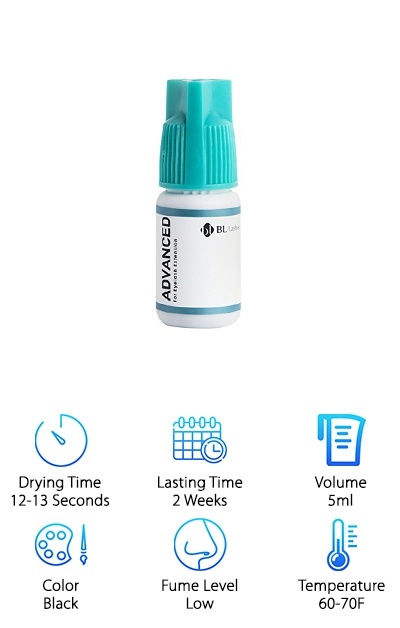 Eyelash extension glue is no longer something best left to the experts – with new and innovative formulas, you can apply your own eyelashes easily at home, too. There are also great products out there to use at the beauty salon. To help you find the best eyelash extension glue, we’ve researched a variety of new and bestselling products. The result is the top ten eyelash extension glue review list below. Before we get started, here’s what you need to know when shopping. 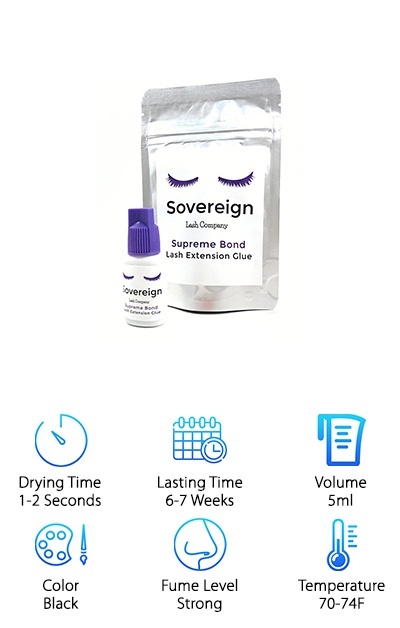 Drying Time: Since we feature both permanent eyelash glue and semi-permanent glues in this top ten review, it’s important to also note how quickly the adhesive will stick and dry in place. Some do it in seconds, others take just a little longer. Lasting Time: The best glue for eyelash extensions varies since some of you are looking for long-term solutions. Others need a great look for a wedding or another special event. By including the lasting time in our reviews, we clear that issue up. Volume: In general, the best eyelash glue should last you awhile. One of the things you’ll need to know is the number of milliliters contained in each of the bottles in our top ten reviews. It’ll help you plan for purchasing! Color: The majority of the favorite eyelash glue products selected by our reviewers come in either black or clear liquid. You may prefer black since it matches most lash extensions, or clear to keep things cleaner. Either color is a winner! Fume Level: We specifically looked for low-fume items, since the best semi-permanent eyelash glue often comes with a familiar smell. Check our chart to see if the glue you like also features minimal fumes when opened and used with lashes. Optimal Temperature: Each of these items on our list of the best eyelash extension glue can be used at both an optimal temperature, and an optimal humidity. We have placed the ideal temperature on our handy reference chart for easy review. 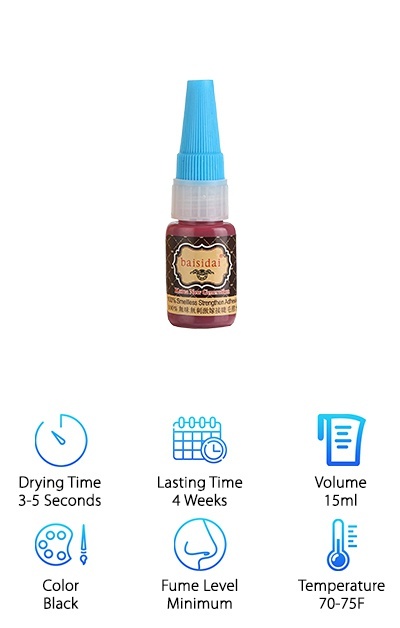 Now that you know how to choose a great bottle of eyelash glue, let’s get right to the reviews. Here’s the deal: If you’re in a hurry, just eyeball our top pick and our budget pick. Both are fantastic products, and among the very best we found. Right below, you’ll find all runner-ups in our eyelash glue reviews. If you’re looking for the best eyelash glue on the market, chances are, they are on this list. Let’s get started! A popular and beloved beauty trend is the classic set of eyelash extensions. While fake eyelashes are also well-liked, eyelash extensions can last much longer. They also keep you from going through all of that work every single day, or for every special event. The process is doable by both professionals and at-home enthusiasts. You do, however, need the right glue. 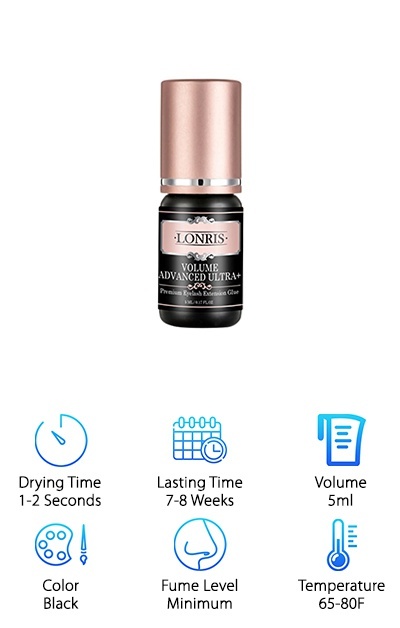 Our top pick is the Lonris Pro Eyelash Extension Glue. Not only is it extremely strong – it’s also professional strength. What are we talking about? 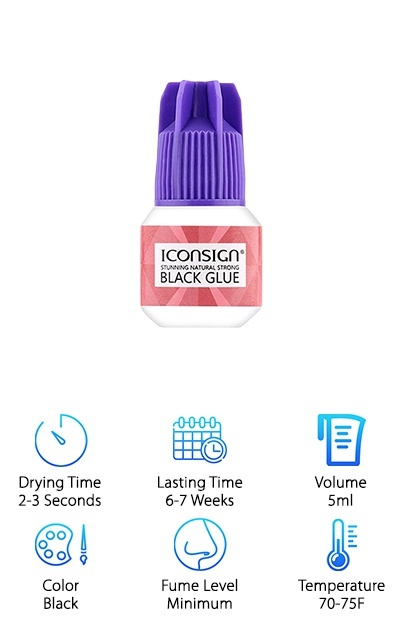 This glue will dry and set in just 1-2 seconds. That’s it! And it will last up to two months. No more daily, exhausting eyelash routine. You will receive 5 milliliters of the Lonris Glue in a small rose gold and black bottle. The glue itself is black and will give off minimal fumes. It comes in a sealed bag with silica gel and a red needle to prevent early dry-out. You’ll love it! If you wear mascara or any other makeup, you know it can be tedious doing the same work every day. That's why eyelash extensions are such a great option. Instead of an everyday task, suddenly you can skip lashes or additional mascara for several weeks! It's a timesaver, and it saves money, just like our budget pick. 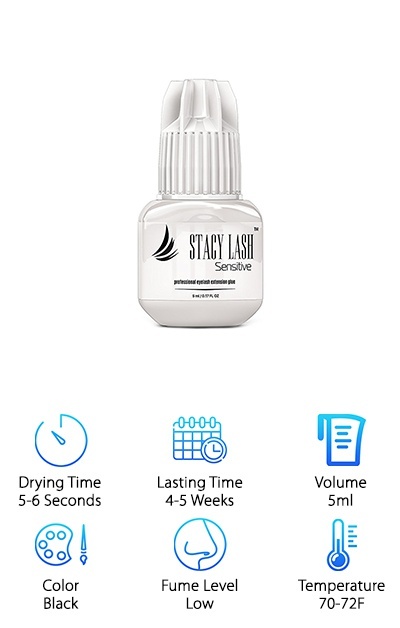 We selected Stacy Eyelash Extension Glue because it is an expert option anyone can use. How does it work? Remove the bottle from its moisture-free packaging, and shake it for 30 seconds. Each portion of the 5 milliliters of black glue will dry black within 1-2 seconds after placement. This glue is made to be used with classic eyelash extensions, and it will keep them looking gorgeous for 7 full weeks. Keep the glue in a dry place, with temperatures around 72 degrees Fahrenheit. Keep shaking it before every use, and keep your lashes moisture-free for a day after application. You’re welcome, gorgeous! The best eyelash glue for individual lashes is going to create a strong bond between someone's real lashes and the new extension strands. Eyelash extensions come in three types: Synthetic, mink and silk. All of them will stick and stay put for a long time until a fill is necessary. If you've ever considered getting eyelash extensions, be aware that the right glue is just as important as the right strand selection. Why? Because it has to be a product that’s easy to use, that works quickly and doesn’t create a lot of hassle in what is often a 2-3 hour process. Our reviewers love the Blink Lash Ultra X Eyelash Glue. It is the real deal. Salon employees and beauticians love it because a small drop is all you need for a full application. 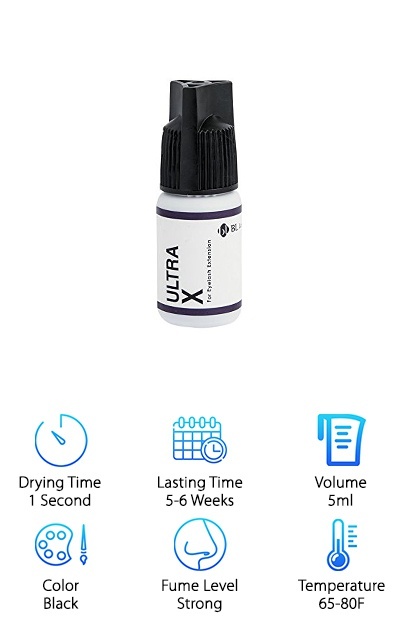 It dries in just a second and lasts up to 6 weeks. With 5 grams of Blink Lash, you'll get multiple rounds of extensions. A super adhesive means super lashes for the bold and the beautiful. It will make your eyelash extensions hold on through just about anything. While many have tried fake eyelashes, eyelash extensions are something completely different. These are individual lashes, made from human hair, animal hair and synthetic substances. One by one, they are carefully glued onto the ends of your natural lashes. So, the glue has to be pretty great! Our reviewers want to introduce you to GARYOB Eyelash Extension Glue. What’s the bottom line? This stuff is just what you need to makeover your look or the look of your clients. 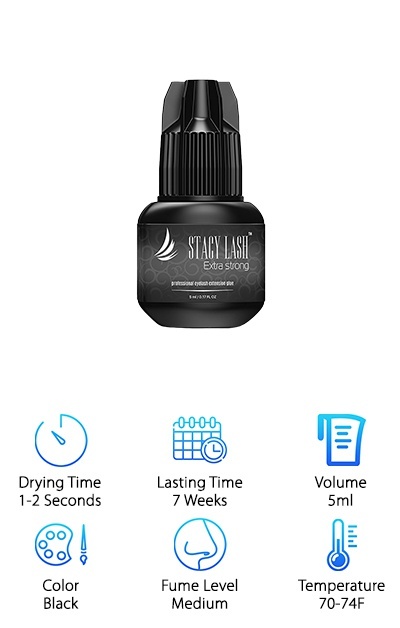 Its incredible retention power will hold on to lashes for up to 7 weeks at a time. The black adhesive dries quickly – in just 2 or 3 seconds, bonding tightly to the hair. You get 5 milliliters of the viscous black liquid, and it should last you about 2 months. You’ll smell very minimal fumes when opened. What exactly are eyelash extensions, anyway? Added onto your natural lash, they make your lashes thicker, fuller and even more curly. They take you from blah to bombshell in minutes. It’s easy to understand why, then, the quality of the glue is just as important as the quality of the lashes themselves. 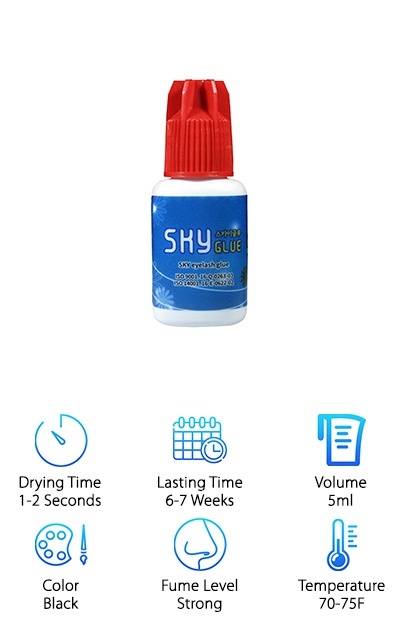 Check out Baisidai Eye Lash Glue. Here’s why it’s great: It’s strong enough for salon use, but it’s also recommended for personal home use! And this glue is designed to be smell-free. Find out if you can finally say goodbye to watery eyes due to stinky eyelash glue. You also receive a generously-sized bottle of Baisidai Glue, 15 milliliters. It'll last you several months and multiple rounds of applications. The glue itself is black and viscous and will dry within several seconds for optimal attachment. It helps eyelash extensions last for up to a month, which is perfect timing for a fill. Don’t hesitate to go glam! Getting ready for a glamorous night out or a major event can take a lot of prep work. The makeup can be expensive, which is why services like eyelash extensions have become so common. It removes one major step for preparation by getting you the dark, dramatic eyelashes you crave. With the right application, lashes, and glue, you'll knock ‘em dead in much less time. That’s also why you should consider Blink Advanced Glue Eyelash Extension. This bonding glue is ready to go at expert strength. It's got a great value, too, because it's usable for a month – you'll be able to make use of it for both an application and a fill, saving you money. This economical choice comes in a white and blue 5-milliliter bottle. It’s stored in a bag with silica gel to stay dry and prepped. The adhesive is black in color. Keep it in a cool, dry place, and away from high humidity. Want lash extensions that will reach up to the sky? OK, perhaps that’s a bit extreme, but you’ll be amazed by the results of a professional application of eyelash extensions. These dramatic lashes open up your eyes and bring out their color. You might even start skipping the mascara! If this all sounds like a great deal, you also need to ensure you’re using the proper professional-strength glue. Our reviewers selected Sky Eyelash Extension Glue from Stacy Lash. Made in South Korea, it’s used exclusively by competent, licensed beauticians. You’ll receive 5 milliliters of the glossy black liquid. Shake and place a drop on a crystal or jade stone, and then dip individual lashes to coat and bond to the customer’s hair. It will work in mere seconds, and last up to 7 weeks. Sky works well in both low and moderate humidity. This adhesive is one of the strongest available on the market. Try it out today! The application of eyelash extensions is always best left to a professional, and professionals know to get the good glue to make the job last. Many of them choose Supreme Bond Strongest Lash Extension Glue. It's all in the name! And in the details: You will receive a strong product that dries quickly and lasts for weeks. 6 to 7 weeks, to be exact. That's well beyond the normally recommended time frame for a fill. It will also dry within just a couple of seconds for each hair or synthetic lash. Place a generous drop on a crystal or jade stone, prep the client and away you go. If you store the unopened bottle in the refrigerator, it can extend the shelf life of this bond by months. You will always have a supply ready to go! You will receive 5 milliliters of black liquid adhesive. You're going to love the final results and your killer new look! If you want to do something right, you’ve got to do it yourself – or, go to an expert who knows what they’re doing. Eyelash extensions are put into place on one of the most sensitive parts of your body, so naturally, you want to use the best. That means supplies and assistance all need to be top-notch. 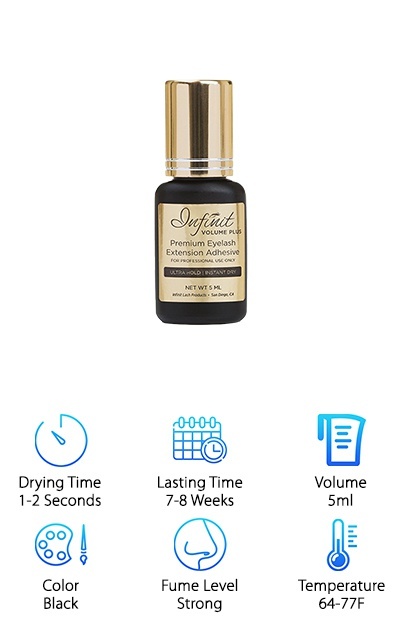 Bottom line: You need to be using Infinit Eyelash Extension Glue. Whether you’re getting a full set of lashes placed, or just a handful at the ends to enhance your look, this is a solid choice. Infinit Glue comes to you in smart packaging. You get 5 milliliters of the black glue placed in a bottle with a double-blocking system. That means glue doesn’t leak out, and air doesn’t leak in, drying up your product. Impressive, right? Professionals love its long-lasting qualities. When it’s used correctly, lashes will stick around for up to 2 months. This glue is very thin, very sticky, and strong. Do you desperately want to try eyelash extensions, but you're worried that the glue will irritate your eyes? Our reviewers were really excited about Stacy Sensitive Eyelash Glue. Two important features will help to mitigate irritants as your eyelashes are applied. First: The fume level is low. Second: This is still a quick-drying glue. In fact, in 5-6 seconds, you will have the hold you're looking for. You'll get a smart little 5-milliliter bottle of the black bonding adhesive. It comes well-protected in a sealed bag with a silica gel packet to absorb any moisture. Store it in a cool, dry place, or in the refrigerator. Apply it in a space with low to moderate humidity and temperatures around 70 degrees for the best results. This glue is made with premium-grade materials for beauticians and salon experts. Stacy Lash is a well-liked and respected brand name in the eyelash extension world. Enjoy treating yourself to a high-quality product.